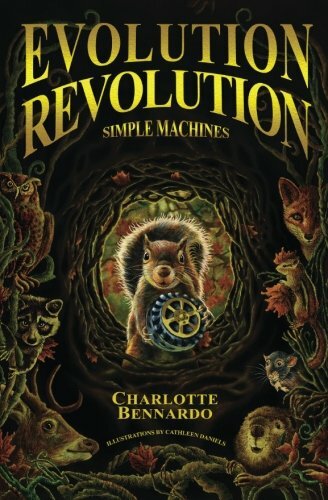 In the book Evolution Revolution: Simple Machines, a squirrel named Jack learns from a boy named Collin how the 1st simple machine, the wheel, is used. Later, Jack sees his forest dealing with an onslaught of human-made machines trying to build some houses. Jack assembles all the animals together and tells them how they can use his knowledge to stop the machines from destroying their home. Evolution Revolution: Simple Machines is the first book in the Evolution Revolution series and is all about stopping the man-made machines. This was a great book; I would give it 5 stars. It is suitable for ages 8-12 as it has no bad language or adult content. It is very enjoyable to read as the plot was very easy to follow. When Jack tries to get the other animals to work together, you can feel the tension in the group as if you were standing beside them. The characters’ personalities came out distinctly; it wasn’t difficult to see them pop off the page. Although the humans are the main enemy, the fox is an additional antagonist who makes the forest animals uneasy, making the story more realistic and interesting. Evolution Revolution: Simple Machines is a fun read, and I gladly give it 5 stars.